So just how much weight can one of my handmade leather camera straps carry? "Can your camera straps support the weight of my *insert camera model*? It weighs *insert weight*?" Is a very common question I am asked. And the answer is invariable. Yes! Yes it can! Now as a picture is worth a thousand words I thought that I should test one. So this is my Globetrotter camera sling supporting a 25lt water container. And yes it is full! so that is around 25kg supported quite happily. This then made me think. What else could I hang from that strap. Hhmm! What's that in the background. I know. What about a bale of hay. That's about 45kg. Surely not. Well would you believe. 45kg supported by a handmade leather camera strap. And no damage to the strap. In fact it went straight back to use. So yes. 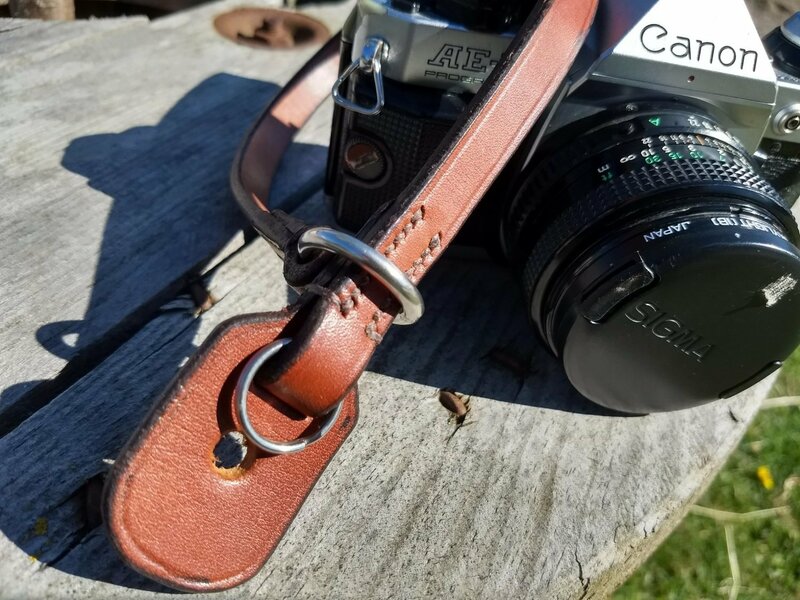 My handmade leather camera straps can support your camera. Even when it has a massive telephoto lens attached! I have been tinkering with some new websites recently. I decided now was a good time to have some web specific names and to split some of my store items. I also needed to buy up some domain names like www.oaksidesaddlery.uk using the recently introduced .uk web address. It was also a chance to play with some settings and see what I could come up with. Having my store with Ecwid makes it easy as I only have to add the store to each website - and viola! there it is. A simple search of the internet will throw out a myriad of camera straps. From the standard manufacture's stock one, to custom made bespoke straps costing more than your camera! My ethos is different. I make camera straps that are designed to do their job, with strength, and style. I use leather from JE Sedgwick. JE Sedgwick make the finest English Bridle Leather that has the strength, durability, and robustness required of a modern day camera strap. So what strap do you need? To be honest I haven't got a clue. I don't think anyone else has either really! My suppliers are UK based so in theory this shouldn't be an issue. Shipping to Europe will probably change as you can guarantee that your government will want to charge an import tax on your goods! I will also expect postage costs to Europe to increase. Not because it will be more expensive to ship there, but because they can! An option for my handmade leather Cavesson Dog Collar is to have a soft leather lining. There are a variety of linings to suit any flavour. I use genuine pull-up leather which has a distressed look with a silky soft feel.